By now the noise of the engagement had reached the king, who came to the front line, dismissing from his mind the danger of which he had been forewarned – though in deference to his friends’ pleas he did put on his cuirass, which he rarely wore. When I read the above passage this morning*, the last four words immediately jumped out at me – which he rarely wore. What, I thought to myself, Alexander rarely wore armour? That cannot be; Curtius has made a mistake. In Chapter 13 of Book 4, however, he once again observes that Alexander ‘very rarely… wore his cuirass’ and that when he did, it was only ‘at the request of his friends’. But, Alexander definitely wore armour. This is confirmed by the Alexander historians**, including Curtius himself. Visual references also show that he wore armour. 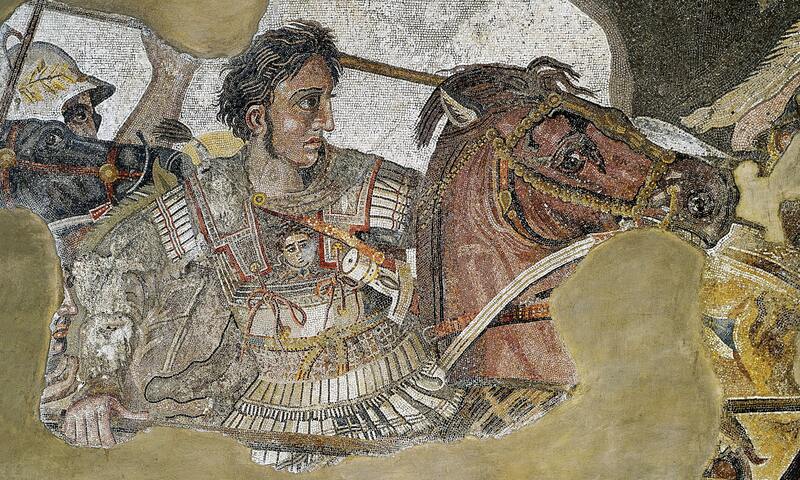 For example, the famous Alexander Mosaic. The only thing I can say about the mosaic is that it was made around 100 B.C. – just over two hundred years after Alexander’s death; it is believed, however, to be based on an early third century B.C. original (see its Wikipedia entry here). 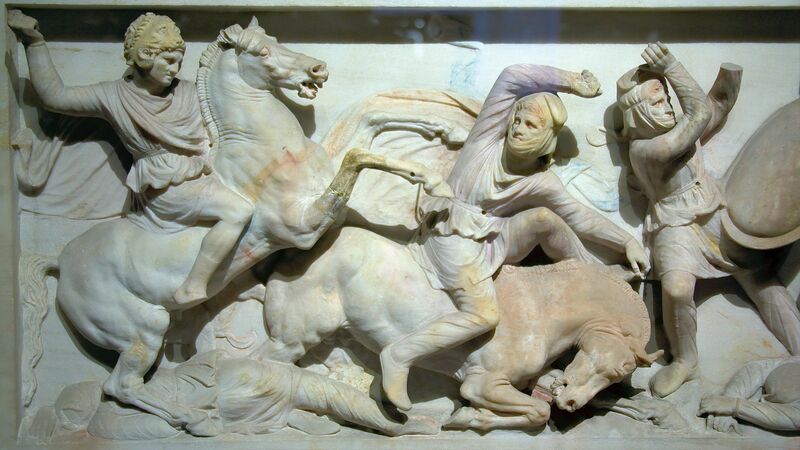 On the other hand, the sculpture of Alexander on the side of the Alexander sarcophagus appears to me to show the Macedonian king without any armour at all. Now, for all I know, he is wearing armour – it’s just underneath his tunic (though this would be unlikely?) or the sculptor only omitted it for propaganda/aesthetic reasons (more likely). 5. He is both wrong and right. 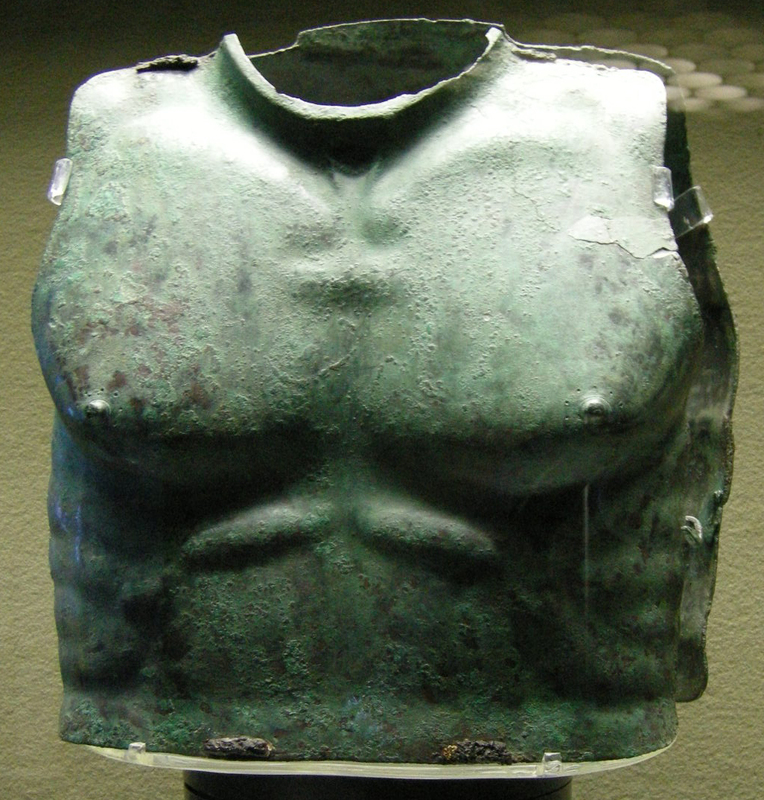 Alexander wore armour but only wore a particular type of cuirass rarely – perhaps the muscular cuirass (below)? Can you think of any other options – or know the answer to this puzzle? Even if you have as much idea as me, feel free to leave your comment below! I think we must interpret Curtius literally: ‘rarely’ means Alexander did wear armour, but not always when fighting. Therefore I choose your no.1. Thank you. I wouldn’t put such an action past Alexander. I’d go with option 5. It’s the specific mention of cuirass which suggests that. Am reminded of long discussions about the Amphipolis regulations of Philip V where the cuirass and half-cuirass suggest heavier armour for the file leaders of the phalanx. Some (eg Hatzopolous) suggest that there’s a distinction being drawn between metallic and non-metallic armour. Perhaps that’s the distinction being drawn here too between what we see in the Pompeii mosaic to something similar to what was found at Vergina, or something similar to what you’ve already suggested. There’s a very good chance that Philip II’s tomb is actually Alexander’s. Think about it. The frescoe at the entrance describes a known hunt involving Alexander, so this idea isn’t a stretch. The armour and whatnot are probably his. Something isn’t right about that place, regardless.